When managing roof assets it is important to understand roof life cycle and roof life cycle costs. The real cost of a new roof is more than just the price of the installation. To fully understand the cost of a new roof you need to figure in the costs over the life of the roof. Once you begin to factor in roof repair and maintenance costs, energy savings and warranty extension options you can see the bigger picture and understand that proper roof system design and budgeting for maintenance will save you thousands in the long run. The real cost of a roof system is more than just the price of the installation. To fully understand the cost of a roof you need to figure in the costs over the life of the roof. 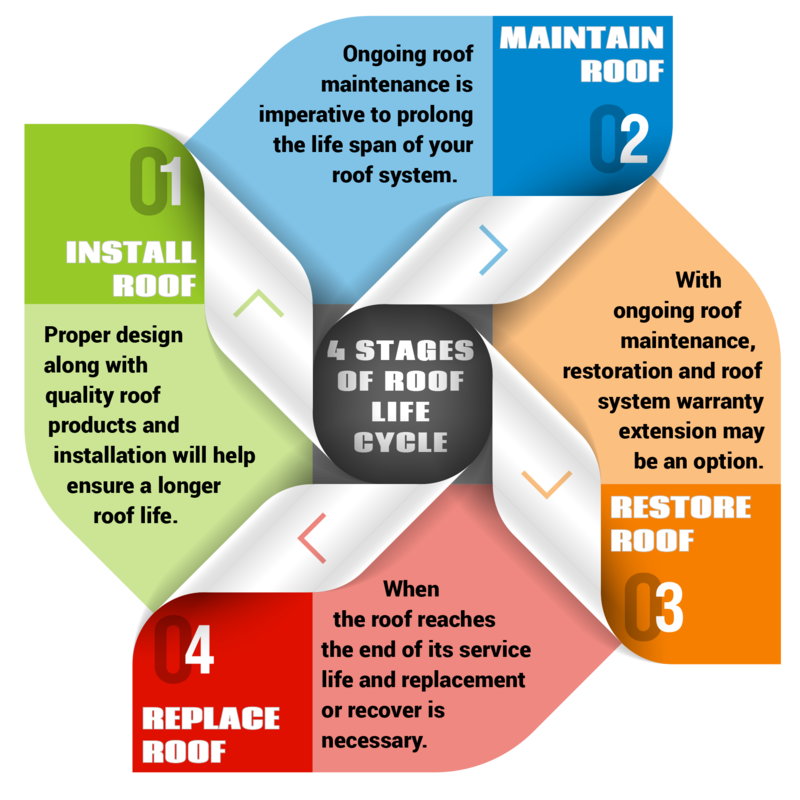 What is Roof Life Cycle? and the inevitable final stage of roof replacement or overlay. Understanding how to properly manage your roof through the stages of its life can empower you to regain control of your roof expenditures and identify opportunities to delay replacements with restoration, extend your existing roof warranty and save money over the life of your roof. There is more to the cost of a roof than just the initial price for installation. When comparing bid prices for a new roof, the lowest bid is not always the lowest cost roof. The most cost effective roof system is the one that costs the least over its life. The most cost effective roof system is the one that costs the least over its life. Instead of focusing on just the cost of the roof installation, building owners should focus more on the roof system that will give the lowest life cycle cost which typically results in a higher installation cost. 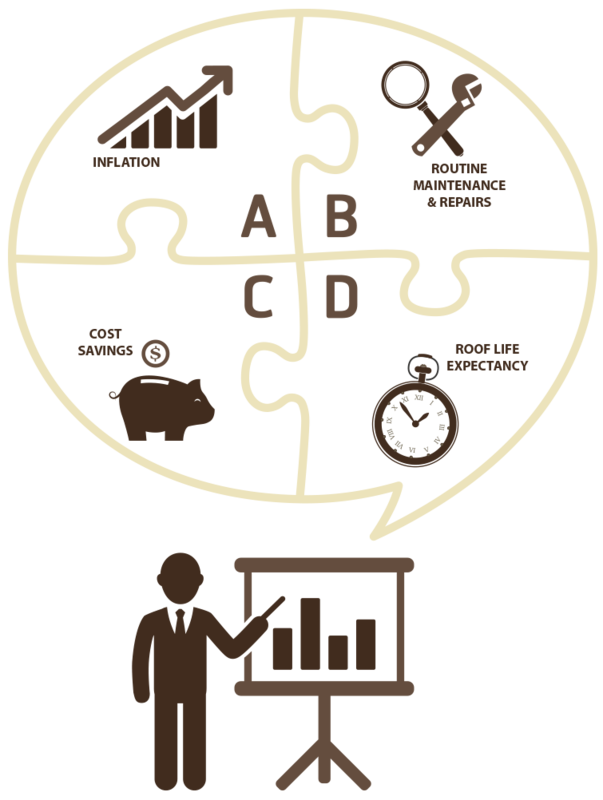 The best way to compare roof systems is through a roof life cycle cost analysis. The standard depreciation for roof systems is 39 years but there are very few roof systems that will still be functioning effectively at the 40 year mark. For most roof systems, if you plan on owning the building for the foreseeable future, 20 years is a reasonable target. The next aspect you need to consider is inflation rate. Since no one knows what future inflation rates will be this has to be an educated estimate based on historical statistics. Inflation in the United States typically falls between 2-4% per year. However inflation rates are lower during a poor economy (0-2%) and higher when unanticipated events occur such as a dramatic rise in oil prices (10%). For our example 5% should provide a safe estimate. 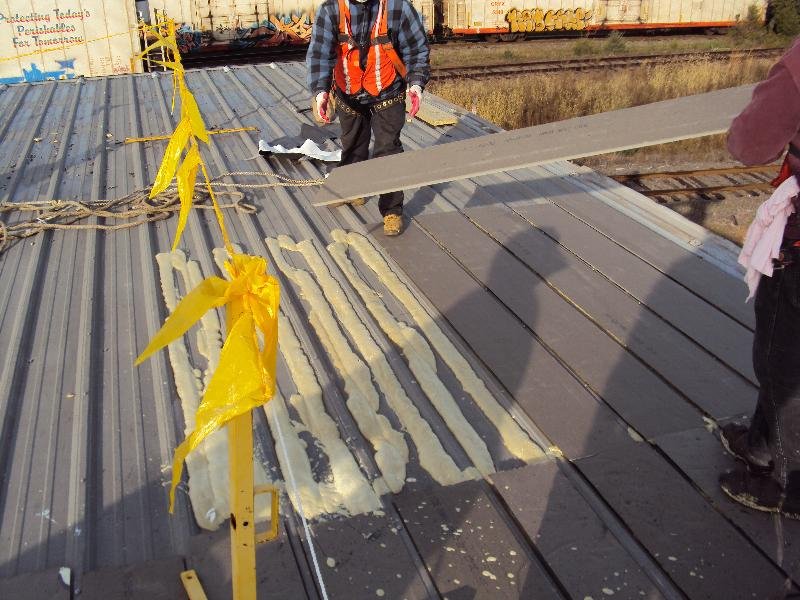 Other costs associated with roof life cycle are installation inspections, semi-annual inspections, costs associated with leak-related repairs, routine maintenance costs such as drain and gutter cleaning, flashing repairs and other housekeeping items. Many of these important maintenance items and semi-annual roof reviews are offered by roofing contractors in bundled maintenance packages with an annual service charge. Other factors should also be included in this analysis such as cost savings. Energy costs savings can provide a huge return on investment over time. Relative life expectancy is also an important aspect of roof life cycle cost analysis. Some roof systems have a longer estimated life and offer longer warranty spans such as 30 years. Keep in mind however that all of this hinges on one very important factor – the quality of the initial installation. If the roof fails before its estimated life cycle is complete you could be facing the cost of a roof replacement much sooner than you budgeted for. The expected life of any given roof system in its specific environment has the most impact on your roof’s overall life cycle costs. Should you base your analysis on 20 years and the roof doesn’t last that long you could end up with higher incurred costs than anticipated. The average premium black asphalt roof has an average life span of 14 years with the average life of a premium white roof is greater than 20 years. A roof system’s actual life span can vary depending on the local environment. In the south UV rays are more intense and can break down roofing material quicker than in northern locations. How the space is used can also affect the life span of your roof should your roof be exposed to chemicals generated by food processing or manufacturing. When deciding what time span to allot for the life of your roof make sure you use numbers that represent the type of material as well as the surrounding environmental factors. EPDM damaged by grease contamination on restaurant roof. One note about warranty periods. Warranties can give false hopes as to the life span of a roof system. A 20 or even a 30 year warranty does not guarantee your roof system will last that long. Make sure that you are familiar with the limitations of your warranty. 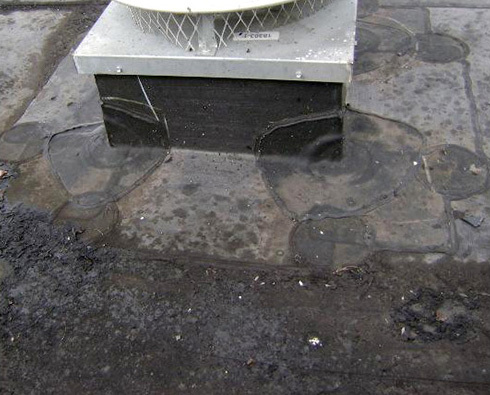 Most premium black roof warranties exclude ponding water, one of the top reasons for roof system failure. Some warranties only cover wind damage up to a certain mph rating. To give you an example of how roof life cycle cost analysis works, we have highlighted a study conducted by a major roofing manufacturer. In 2010 the roofing manufacturer FiberTite conducted a 20 year comparison between a proposed 10,000 sq. ft. black asphalt roof system with a white granular surface and a premium fully adhered white membrane roof in Columbus, OH. The initial installation costs for their example project are very close at $56,800 for the asphalt roof and $57,800 for the white roof. 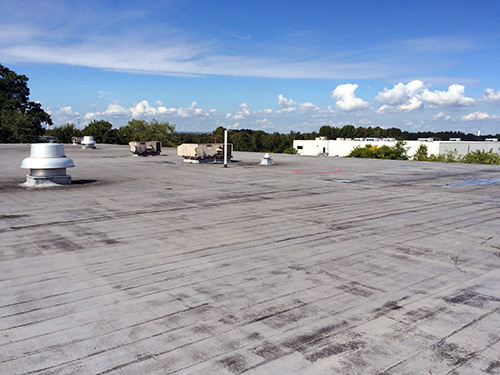 However due to much lower maintenance and renovation costs along with a higher energy savings, the white roof over its lifetime financially outperforms the cheaper to install black asphalt roof. The installation cost of the black asphalt roof was within $1,000 of the white roof but the net cost of the white roof was $46,600 while the net cost of the black asphalt roof was $115,220. How is this possible? Start with the expected roof life and the white roof system has the lead right out of the gate. The white roof system has an expected life of 20 years while the asphalt roof only has about 13.9 years of expected life. The expected life of a roof and its surrounding environment has more impact on a roof’s overall life cycle cost than most other factors. If a roof doesn’t last the desired 20 year span the owner is more likely to incur higher costs for maintenance through the life of the roof as well as the possibility of major renovation or early replacement costs. How the space below is used can also attribute to a higher life cycle cost. Is the roof located in the south where the UV rays are more intense? Or perhaps the tenant is a restaurant. Is the roof being exposed to chemicals and grease? These factors can subtract years from your expected roof life. For their example, Fibertite pulled from the Department of Energy’s statistics that measured energy savings of various roofing systems throughout the United States. Over a 20 year period the white roof is expected to return $16,000 in energy savings, where the black asphalt roof is expected to return a fourth of that at around $4,000. According to an extensive study performed by a leading roof consultant, due to the shorter life span of an asphalt roof as well as UV degradation, the asphalt roof will cost $23,300 in maintenance costs over 20 years where the white roof will only run you about $5,800. This is based on both roof systems having semi-annual inspections and regular preventative maintenance. According to their referenced consultant, and we concur, the maintenance costs would be about the same for these two systems at first and then the cost for maintenance on the asphalt roof would begin to accelerate. Given the shorter life expectancy of the asphalt roof along with the 20 year goal, there would most likely be a need for major restoration if not early replacement by the 15 year mark. FiberTite’s example goes the major renovation route with a price tag of about $29,157. Now this exact figure depends on many factors such as maintenance of the system and ongoing repairs. However this is a pretty reasonable example for such a roof in the environment specified. The white roof has a price tag of $0 over its 20 year example. 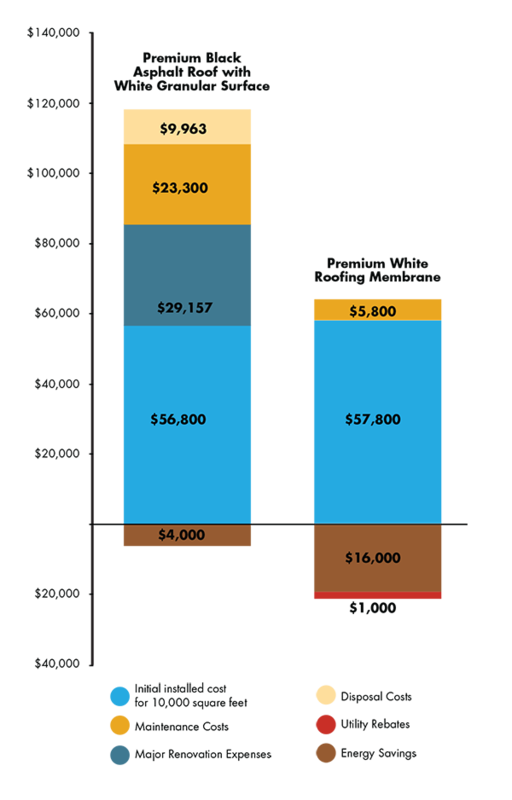 We feel that this figure is slightly skewed and would anticipate at least $5,000 over the 20 year period. Still the white roof financially outperforms the asphalt system. For their example, FiberTite has assumed that their example is a roof replacement with the existing system being a 3-ply built-up roof system with the structure weight limitation being close to its maximum. To illustrate the impact of disposal costs they assume that for the installation of the new asphalt roof the existing roof system would need to be removed. The also assume that the white roof system could be installed directly over the existing roof system saving $9,963 on the initial installation. Their example does not cover the labor required for the removal of the existing system either, just the material disposal cost. In our opinion the ability to install the white roof over the top of the existing system is a viable option as long as the existing system is deemed sound enough. However roofing standards and most local authorities require at least a partial roof removal if there is more than one existing system already present. Do not assume you can go over your existing roof just because you are specifying a new white roof system. FiberTite’s scenario is a good example of the benefits of doing a roof life cost analysis before choosing a new roof system. While every project is different depending on your needs, location and use of space, this type of roof life cost analysis will help you find the best solution for your facility. It is also important before you begin your roof system selection to fully understand your existing roof system along with any design limitations it may present. To read FiberTite’s full roof cost analysis study click here. When it comes time for a roof replacement selecting a roof system design can be a daunting task. There are hundreds of roofing systems on the market today and it can be difficult to determine what the best and most cost effective system for your facility may be. Roof Asset Management can arm you with accurate information allowing you to make confident, prioritized performance based decisions to be made in order to maximize the effectiveness of your roofing investments. Contact us today and we can help you choose the best roof system with a low life cycle cost while still maintaining top performance from your roofing system. Request Roof Asset Management services now! Request Roof Asset Management services today! a Pennsylvania Corporation d.b.a. RAM Infrared Services Inc.
RAM Infrared Services Inc. is a knowledge based firm that seeks to educate and inform our clients about their roofing assets. It is our mission to assist our clients in the effective roofing system management. I consent to RAM Infrared Services Inc. collecting my details through this form.